Order a FiOS Bundle Now! Frontier® FiOS® bundles provide all the benefits of fiber&dash;optic technology for more than just Internet. Whether you want Internet and phone, or Internet and TV, or all three, FiOS bundles from Frontier bring symmetrical upload and download speeds, stunning HD picture quality, and fewer dropped calls. Check out the FiOS Bundle Favorites and Most Popular Internet and TV Plan in the area. Gone are the days of cathode&dash;ray tube TVs and snowy channels. In its place are HD and 4K TVs, and fiber&dash;optic lines that deliver data almost at the speed of light. FiOS Internet plans from Frontier bring you a fast, reliable Internet connection, and enough bandwidth to stream movies and TV shows in 4K, not just HD. Call 1-855-275-8219 to get FiOS Internet today! FiOS Internet and TV bundles from Frontier are a match made in heaven. 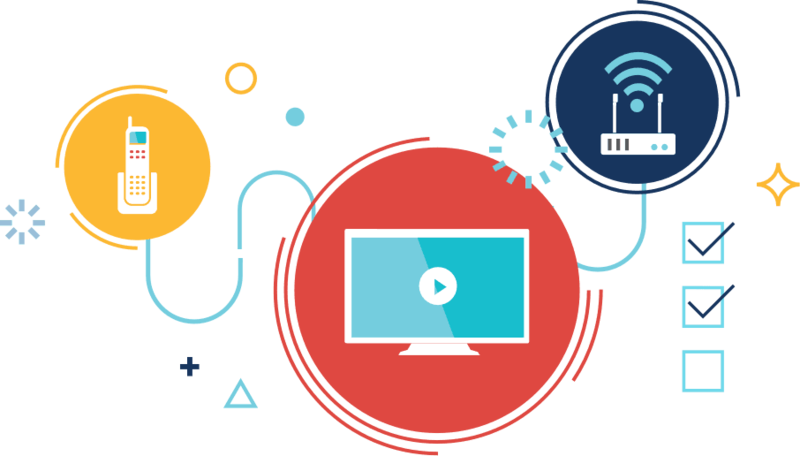 FiOS Internet gives you symmetrical upload and download speeds, limiting lag time whether streaming or gaming, so the experience remains smooth. With FiOS Internet plans from Frontier, you also have enough bandwidth to stream and game in 4K, not just in HD. With FiOS TV from Frontier, and its more than 315 channels of sports, news, movies, and family entertainment, you’ll never want for something to watch. Get favorites like ESPN®, HGTV®, the Discovery® Channel, the Disney® Channel, and more with FiOS TV and Internet from Frontier. Call 1-855-275-8219 to order today! A Triple Play FiOS bundle from Frontier gives you all the benefits of FiOS for Internet, TV, and phone. You can choose the Frontier Internet speed that best suits your needs, whether you need more bandwidth for more users, or simply want a better streaming or gaming experience. That’s not all. With a Triple Play FiOS Bundle, you also get over 315 channels with more than 40 in HD, and reliable phone service with unlimited domestic calling. Fast, reliable Internet, over 315 channels, and a reliable phone service with clear voice calling all make Frontier FiOS 50/50 + FiOS TV Prime HD + Digital Voice the most popular triple play. When you bundle FiOS 50/50 with digital voice, you may not need TV. Why? Because you’ll get symmetrical upload and download speeds along with enough bandwidth for friends, family, or roommates to stream their favorite movies and TV shows on their own devices. In other words, with a FiOS Internet and phone bundle, you don’t have to fight over what channel to watch. And with Digital Voice from Frontier, you get a reliable, secure phone connection with unlimited domestic calling, caller ID, and call waiting. Call 1-855-275-8219 to get your FiOS Bundle today!